Could say only that the virus was neither A nor B // To no avail, screened millions of genetic sequences to find it // Finally uncovered it with an untried technique. 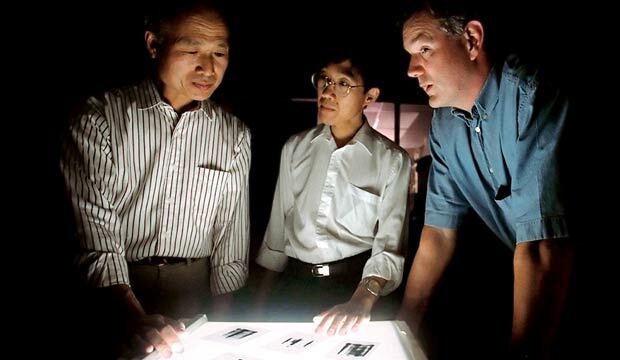 The 1989 discovery of the hepatitis C virus by George Kuo, Qui-Lim Choo and Michael Houghton (from left) was a triumph of new techniques and good old human perseverance. The two infectious diseases are among the world’s deadliest, together killing as many as 5 million people a year. Both are caused by viruses identified during the 1980s, and both can be spread by blood transfusions, shared needles and, to varying degrees, sexual contact. Yet in terms of public profiles, they couldn’t differ more. The fight against AIDS long ago became a cause célèbre, the research dollars flow freely, and although there’s still no effective vaccine or cure, advances in treatment have transformed AIDS into a manageable chronic disease. The other killer, hepatitis C, remains relatively obscure. Breakthroughs in understanding the virus, when they come, don’t make the nightly news. But it would be wrong to assume that hepatitis C is a lesser threat. The World Health Organization estimates that 170 million people, about 2.5% of the world population, are infected with hepatitis C. That is three to four times as many as have the human immunodeficiency virus (HIV) that causes AIDS. And while in the United States sophisticated blood-screening methods and less frequent needle-sharing among intravenous drug users have forced the rate of new infections sharply downward in recent years, an estimated 4 million already harbor the virus, which may lie dormant for decades before erupting into life-threatening symptoms. In the developing world, the disease continues to spread, and the ultimate toll could be devastating. Some who have the hepatitis C virus (HCV) will never know they’re infected. A fortunate few, perhaps 20%, are able to clear it from their systems within the first six months, during the disease’s acute phase, which is usually mild or asymptomatic. But the rest go on to chronic infection. One in five will develop cirrhosis of the liver, a condition in which normal liver tissue is replaced by nonfunctioning scar tissue. And a significant number of those with cirrhosis will develop liver cancer. Some five in 10 U.S. cases can actually be cured, with the virus eliminated from the patient’s body. That’s true of no other chronic viral condition—not hepatitis B, and not AIDS. But where the need for treatment is greatest—for example, in Africa, where more than 5% of the population is infected and the infection rate continues to rise—the cost of the best therapies puts them out of reach for most of the infected population. Against this backdrop, remarkable work on the disease is being done. The discovery of the virus, which took more than five years, using untried techniques and requiring frequent leaps of faith, is one of the triumphs of molecular biology. Now, finally, a vaccine may be in sight. Yet despite great progress, hepatitis C remains a real and present danger, particularly in the developing world. It may not be AIDS, but it continues to pose major challenges for medical researchers, and defeating the disease will require time, funding and still more scientific brilliance. This map, compiled by the World Health Organization, shows estimated levels of hepatitis C infection by country as of 2000. 1. “Epidemiology of Hepatitis C Virus (HCV) Infection,” by Theodore Sy and M. Mazen Jamal, International Journal of Medical Sciences, April 2006. An overview of the virus’s worldwide distribution and its various subtypes, as well as a cogent discussion of the risk factors associated with spread of the disease. 2. “Immunoglobulin mimicry by hepatitis C virus envelope protein E2,” by Yu-Wen Hu et al., Virology, Jan. 12, 2005. This article presents a novel way of understanding how hepatitis C infects: Through a process called molecular mimicry, the virus tricks the immune system by producing proteins that resemble human immune chemicals.